MaxSpace | Maxed Out ? MaxCell. Introducing MaxSpace®, the next breakthrough in conduit space maximization. Since the first fiber optic cables were installed in the 1980s, the only way operators could add capacity to their networks was by installing new conduit and innerduct infrastructure. This was a time consuming and expensive process, with additional engineering and permitting costs, EPA reviews and approval, not to mention disruptions to traffic, homeowners and merchants. Until now. 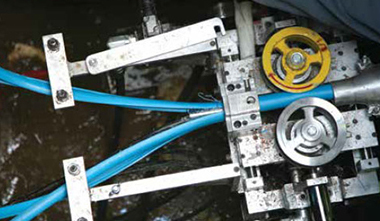 MaxSpace is a no-dig conduit space recovery solution designed to safely remove rigid innerduct from around active fiber cables with little to no load on the cable and no interruption of service. Both the method of removing innerduct over operating cables and recovering space and the specialized equipment used are patented and protected. US Patent Numbers 9,391,433 and 9,391,434. 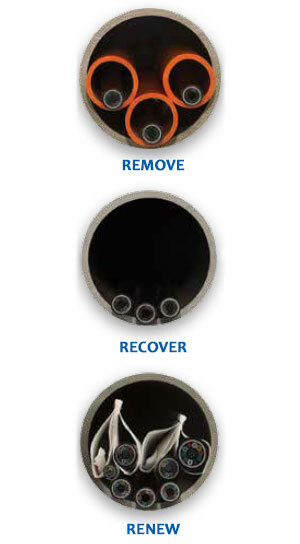 The conduit space recovery machine uses a split metal sleeve to protect the active cable while the innerduct is extracted. Rigid innerduct is then drawn into the machine using opposing drive wheels that force the innerduct through four cutting blades, slicing the innerduct into quarters. The sliced innerduct is then fed into a chipping machine and compressed into disposal bags. Complete your MaxSpace project by filling your new available space with MaxCell! Over 400 million feet and 1 billion pathway feet of MaxCell — equaling nearly 600 million feet of cable channel — have been installed globally. With its flexibility and space compression features, you can install up to 300% more cables in your network structures with MaxCell. Available in Standard, Detectable, Plenum, Riser and Self-Supporting, as well as in various sizes and numbers of cells, MaxCell can be used in any conduit encased, in cabletray, or wall-mounted network infrastructure. Use that new space to load your pathways with MaxCell and provide room for cables you need now and in the future!